Dazzling glass bowl accented with crystals by Cassiani Signature collection. 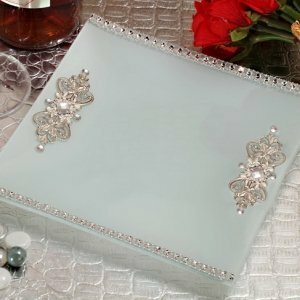 A stunning addition to your special day, these favors will impress your guests with dazzling elegance. Each square glass bowl measures 8" x 8" and is accented with a string of crystals on each side and ornate silver accents. Each comes packaged in our exclusive Signature collection two piece white gift box. What is the weight of each tray and my understanding is it made up of glass material and not glass look alike? 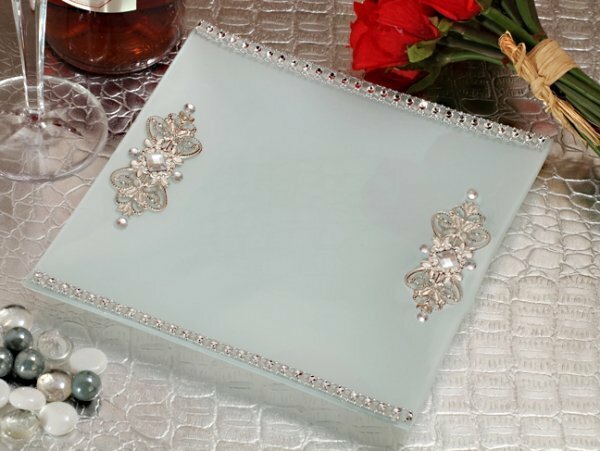 The approximate weight of each Square Glass Tray with Crystal Accents Wedding Favor is 1.45 pounds and it is made of glass.